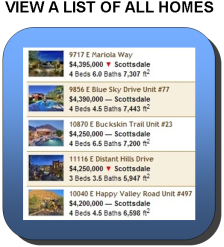 From this page you can easily view all Tuscany Villas condominiums for sale in Scottsdale from the Arizona MLS. 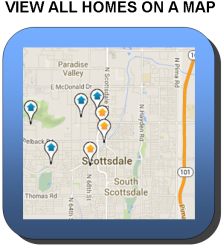 Our real estate listings are updated daily! To begin, simply click on your choice of buttons below to view a list of all condos, or to view properties by location on a map. Parents outside of the Scottsdale Unified School District (SUSD) boundaries, or those already enrolled and choosing another SUSD school, may enroll their child in an SUSD school based on the school’s grade and program capacity. See the SUSD website for further details. In addition to other courses, Tuscany Villas is in close proximity to the Stonecreek Golf Club, Kierland Golf Club, Orange Tree Golf Resort, Gainey Ranch Golf Club, McCormick Ranch Golf Club and Paradise Valley Country Club. Is Tuscany Villas our favorite condominium community in this area of town? Quite simply no. However, at the time of this writing the least expensive one bedroom in Aderra is listed at $189,000 , while the most expensive one bedroom condo at Tuscany Villas is listed at $109,000. Catch our drift? Aderra is practically new, has elevators, underground parking, golf course and mountain views. However, at this lower price point, the value at Tuscany Villas can’t be touched. Tuscany Villas has one feature that you won’t find from most other communities in this area. Shopping located right outside of the gated subdivision. Literally, throw on some tennis shoes and you will be shopping or having a relaxing dinner within a few short minutes. If you don’t want to drive, or can’t drive, you can get away without having a car living here. Combine this with nice walking paths, fitness center, heated pool and spa, the fact that all units were renovated in approximately 2005 and you have a winner. Another thing to note is a fair number of the buildings are three levels. Some buyers don't want to, or can't physically climb that many steps to access their home. If you are one of them, disregard any condos for sale where the unit number starts with the number three, as these will be located on the 3rd level. Get to know the community of Tuscany Villas in 56 seconds with our community tour uploaded to YouTube in HD.